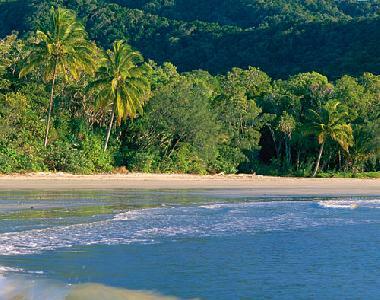 Cape Tribulation is the jewel in the crown of Far North Queensland and is the place where the world heritage listed Daintree Rainforest meets the world heritage listed Great Barrier Reef. This unique region is a great place to have a relaxing holiday because it boasts a friendly and relaxed atmosphere and there are many different activities that you can do in the surrounding region. This includes adventurous activities like snorkelling, scuba diving, bush walking and croc wathcing or more relaxed activities like bird watching, swimming and sunbaking. Regardless of whether you are in Cape Tribulation for a short getaway or a long holiday you will find a wide range of accommodation options available. This includes everything from budget Cape Tribulation hotels and backpacker acommodation right through to luxury 5 star hotels and suites. Heritage Lodge and Spa in the Daintree - For many years families and couples have been staying at the Heritage Lodge and Spa in the Daintree because of its unique home and from home feeling. Also this Cape Tribulation hotels friendly and welcoming staff, combined with an excellent array of facilities will make sure that your stay in North Queensland is hassle free. These facilities include an outdoor swimming pool, BBQ facilities, bicycle hire, free car parking, tropical gardens and courtyard, equipment hire, daily housekeeping, faxing facilities, ice machine, guest laundry, masseur, outdoor furniture, sun deck and tour desk. Ferntree Rainforest Lodge - The Ferntree Rainforest Lodge is a very popular place to stay in North Queensland because of its wide variety of hotel facilities, excellent location and warm, friendly service. Travellers who choice this budget Cape Tribulation hotel will find themselves within easy reach of everything that the Daintree region has to offer. The special discount accommodation at the Ferntree Rainforest Lodge has lots of resort style facilities including 2 swimming pools, BBQ facilities, tour desk and bike hire, whilst still remaining very affordable to the budget conscious holiday maker. The Ferntree Rainforest Lodge has magnificent gardens which have been designed to attract lovely rainforest creatures which you can see whilst relaxing at this discount Cape Tribulation accommodation. Daintree Rainforest Retreat - With an enviable position close to everything that the Daintree and Far North Queensland has to offer the Daintree Rainforest Retreat is a popular accommodation for travellers on a budget. This Cape Tribulation hotel features a variety of rooms that have been stylishly furnished to suit all of your holiday needs. More adventurous travellers can climb the Tree Top Tower at the Daintree Environment Centre, where you can take in every level of the forest right up to the canopy. However, no holiday to Far North Queensland would be complete without a trip out to the Great Barrier Reef and the Retreat is happy to organize and pre-book your tours to ensure you don't miss out. Tranquility on the Daintree - The Tranquility on the Daintree is a popular place for holiday makers to stay in North Queensland because of its wide range of hotel facilities, great location and warm, friendly service. Travellers who choice this budget Cape Tribulation hotel will find themselves within easy reach of everything that the surrounding Daintree Rainforest region has to offer. Tranquility on the Daintree is an exclusive self contained accommodation experience that allows you to experience everything the Daintree has to offer in Far North Queensland. Guests can relax in this luxury Daintree accommodation, which is ideally situated only a 90 minute drive north of the Cairns Airport and is close to the world heritage listed Daintree rainforest. Cape Tribulation Resort and Spa - There are many interesting and exciting things to see and do in and around Cape Tribulation and by choosing to stay at the Cape Tribulation Resort and Spa you will be well positioned to make the most of them all. At this affordable property guests will find that the hotel rooms are spacious ands well equipped and that the hotel facilities significantly add to the overall experience. It provides quality Cape Tribulation accommodation and excellent guest facilities including a large swimming pool and stunning location close to the beach and world famous Daintree Rainforest. The friendly staff at the Coconut Beach Resort will be more than happy to help you book any of the many tours available including rainforest walks, horse riding, kayaking and day trips to the nearby Great Barrier Reef.